Alright Jalops, this one is a doozy. What we've got here is a hit-and-run driver, a Ford Focus, and the single, solitary piece of chrome that was evidence of the perp's wrongdoing. Think you can help solve it? 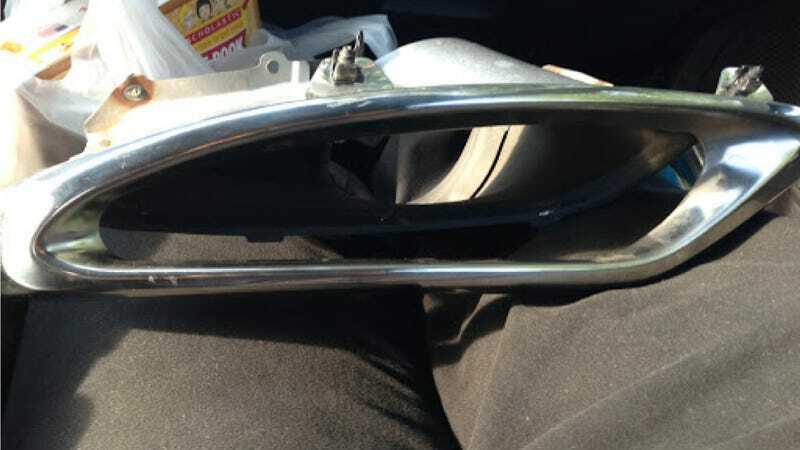 I was Driving my Mother's '09 Focus, And was essentially sideswiped on the front bumper when the other car Ran a Red light while doing at least 65, My front bumper to his passenger side. This occurred in that Odd little stereotype of NYC, Staten Island. This chrome piece is all that was left from this, It happened so quickly I couldn't identify the car. They took down the info we had to give them, dismissed the fact I had a part of their car, and that was that. There were no Security camera's unfortunately. Going to imitate the motherland and get a Dash Cam. Not so bad, you might say, but this is about the principle of the thing. Not only are hit-and-runs up there on the list of heinous car crimes, but a few inches closer to Mike in the Focus and we may be having an entirely different conversation right now. It was an incredibly dangerous situation, and we want to keep all the Jalops we have in the world. So what do you think? Jason Torchinsky and I banged our skulls together for a bit, and it looks like it could either be some sort of exhaust tip or a piece of a front air dam, though don't let that sway you. Of course, we probably won't be able to identify the exact car, but any little bit will help.